Instead of replacing the whole cabinetry according to a ritual followed by the buyers of old homes, inspect it thoroughly and take decision accordingly. Sometimes you just have to give it finishing touches and replace one or two cabinet doors. So, use your mind and save money and time. Replacing kitchen appliances with new ones is a very practical decision that you can make. This way not only your kitchen have a facelift but the efficiency and mood of your wife will be increased and elevated. Although it sounds like an expensive endeavor revamping other features of the kitchen will be irrationally expensive comparatively. Replacing a stained carpet upon shifting to an old house is a general practice. Why don’t you consider putting colorful carpet tiles on your floor instead? This idea has been proven to be cost-effective one in the long run as there won’t be any expenses regarding opting for cleaning services for carpets every now and then. The aura of a house depends heavily on the paint color of the house. So, be very specific while settling for the existing paint color of the house because replacing it according to your taste will not cost you much but is going to reward you infinitely. Like all another aspect of your house, you can also revamp the lighting facilities according to your choice. From Edison-bulb chandeliers to modern pendants there is wide-range of lighting fixtures that you can exploit for fashioning the lighting scenario of your house. Exchanging light fixtures is an entirely another thing and changing the wiring and endeavoring for the electrical repairing of the house is another. This venture is going to give you a setback both financially and mentally. So, before you decide on a house make sure that the electrical work that has been done during construction is functional and operative. Tuning a room with a messy look in a store is something most of us do. Why don’t you do otherwise and utilize it by thinking out of the box and be creative? For instance, you can turn it into a home-office, kids’ playroom or sunny corner of the house where you can do morning activities with your kids. 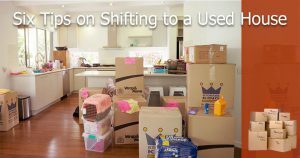 Shifting to an old house is an easier said than done job. You have to face the aforementioned and many more challenges but staying positive and creative is a practice that can earn you a bewitchingly and aesthetically revamped chic house in a cost-effective, efficient and reliable manner. What is 2018 offering to the Future of Pakistan Real Estate market?